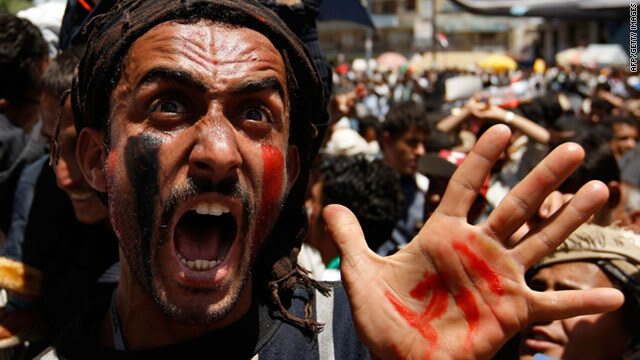 A Yemeni protester demonstrates against President Ali Abdullah Saleh on Thursday, March 24 in Sanaa. (CNN) -- Yemen's president, speaking to thousands of people at a pro-government demonstration on Friday, underscored his intentions to have a dialogue with protesters and make concessions in order to avoid bloodshed. This comes amid a report of discussions between President Ali Abdullah Saleh and a pro-opposition general over guidelines for a peaceful transition of power. Saleh told the throng that while he's ready to hand over authority systematically, he said he won't do so to "gangs," "drug dealers" or the Houthi rebels fighting the government. "We are against chaos and coups and against shooting one single bullet on our people," Saleh said. "We will hand over the authority to you great people." As he spoke in Al-Sabeen Square, anti-government demonstrators gathered in another part of the capital in University Square. The rival gatherings reflected the gulf in opinion throughout restive Yemen, a key U.S. ally and central battleground against al Qaeda that has been wracked by protests since the beginning of the year. The turnouts come after Saleh this week accepted opposition demands for constitutional reforms and holding parliamentary elections by the end of the year, steps that would "end the current state of political turmoil facing the nation" and usher in "a smooth, peaceful and democratic transition," he has said. He has accepted five points submitted by the opposition JMP, including formation of a government of national unity and a national committee to draft a new constitution, drafting a new electoral law, and holding a constitutional referendum, parliamentary elections and a presidential vote by the end of the year. In his remarks on Friday, he addressed these moves, saying he salutes the people's "support for constitutional legitimacy" and a "referendum on unity, freedom, democracy and legitimacy." As for security, Saleh said to the crowd that "you are the military and security of the nation" but stressed that the government "will challenge" those who "challenge Yemen." Ibrahim Mothana, a human rights activist, told CNN the security presence on the streets has been extensive, and he described the anti-government protest as huge. At the protest demonstration, he said, a funeral prayer took place for two of the people who died last week in Sanaa. "I think it is the biggest crowd since the protest started but everything seems under control so far. It seems there will be no clashes today and hopefully there will be no casualties." Eyewitnesses said a statement was read to protesters from the spokesman of Gen. Ali Muhsen Al-Ahmar, one of the several officials who defected to the opposition. "I vow to never go against you and will stand with you until your demands are met," the statement said. "We are very close to victory and need to be patient during the final step. Human rights groups raised concerns that violence could break out on Friday. At least 52 demonstrators were gunned down last Friday by regime loyalists. Amnesty International urged authorities to stop security forces from using "unwarranted deadly force and heavy-handed tactics." "The government cannot just shoot its way out of this crisis," said Philip Luther, Amnesty International's deputy director for the Middle East and North Africa. "Whether in uniform or in plain clothes, security forces must be immediately stopped from using live ammunition on unarmed protesters. Yemen's parliament this week approved a 30-day extension of emergency powers Saleh declared last week in response to protests. The emergency law expands the government's powers of arrest, detention and censorship. "The emergency law appears to be a desperate attempt to reinforce mechanisms to stamp out dissent and shut out witnesses to human rights abuses," Luther said on Thursday. "The Yemeni government needs to uphold its people's right to express genuine grievances and ensure justice for those killed unlawfully." A Yemeni government official, who asked not to be named because of the sensitivity of the situation, told CNN that Saleh and Muhsen, as well as other government and opposition leaders, have held discussions over the last two days on guidelines for the departure of Saleh and his relatives from government. U.S. and British officials in Sanaa have been briefed about the talks, he said. Officials are seriously discussing the creation of a federalist structure for Yemen, dividing it up into autonomous regions akin to those in the United Arab Emirates. Meanwhile, the official said, "the situation is getting dangerous" and there is concern that tribes are taking control of districts in Mareb, Jawf, Saada. The official said Saleh is attempting to gain favor from the grass-roots youth movement that is supported by the opposition. "The country is starting to disintegrate and I think today, from watching President Saleh's remarks -- he's now taking his message to the people, to the youth. They are the group that is orchestrating the (anti-government) demonstrations in Sanaa." CNN's Mohammed Jamjoom, Joe Sterling and Hamdi Alkhshali contributed to this report.